Bangladesh is known as to her citizens as the Sonar Bangla, Golden Bengal, because of the richness of her land that takes on golden hue when the rice crop is ready for harvesting. Bangladesh is also known as the Land of the Royal Bengal Tiger, for the mangrove forests of Bangladesh plays host to some of the most magnificent specimens of the big cat. But, to me, her most cherished treasure is the ilish, or the Hilsa Shad fish. Bangladeshis and Bengalis are noted for their love of fish, and God could not have rewarded them better than providing her waters with this most exquisitely delicious fish to titillate the palates of Bangladeshis. Hilsa shad, one of the most important tropical fish of the family clupeidae under the genus Tenualosa and species ilisha is anadromous in nature, not a common phenomenon in tropical water compared to temperate and arctic regions, lives in the sea for most of its life, but migrates at least 1,200 km up in some river system in Indian sub-continent for spawning behavior. Distances of 50-100 km are more typical in Bangladesh. 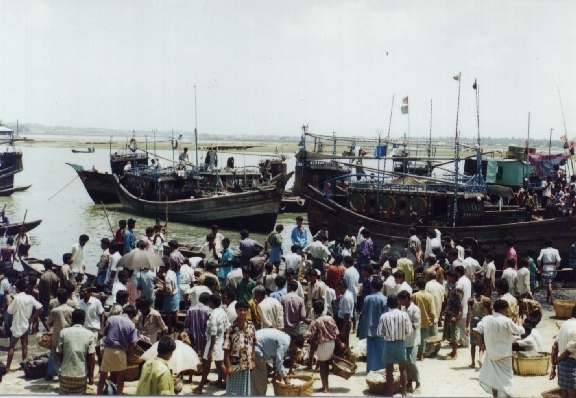 Hilsa shad contributing 30 % of total fish production of Bangladesh, and about 40 % fishermen or 2 % of total population of the country earn their livelihood depending on Hilsa fishery directly or indirectly. Therefore economic contribution from this single species of fish is very high, in an agricultural based country like Bangladesh. Three separate species of Hilsa Shad are found in Bay of Bengal, they are Hilsa kelee, Hilsa toli and Hilsa ilisha now Tenualosa ilisha. Tenualosa ilisha is considered as anadromous species while the other two species are restricted to marine environment. And in this report we are dealing only with anadromous stock. During the commencement of the south-west monsoon and consequent flooding of all the rivers, Hilsa shad starts its spawning migration upstream. A mature Hilsa shad with a length ranging from 30-55 cm lays 0.1-2.0 million eggs, the eggs are deposited in fresh water, and hatching takes place in about 23 to 26 hours at an average temperature of 23oC. The newly hatched larvae is recorded as 2.3 mm in size and the larvae and juveniles make their way downstream to the sea during a period of several months, feeding and growing on the way. At this stage of their life cycle they are locally known as “Jatka“. Jatka the juveniles of Hilsa shad from 4-15 cm are widely available during the period from February to May in the foreshore and riverine water of Padma, Meghna and other deltaic rivers of Bangladesh. Usually Jatka grazes for five to six months age in fresh water before they migrate to seawater. They are caught in large amount using current nets of small mesh size during their grazing period in rivers as well as in sea shore by artisanal fishermen to sell them in local markets, calling them “Chapilla” instead of “Jatka“, which is a different species of fish, and thus exploiting this resource in a way. According to a report published through Bangladesh Fisheries Research Institutte,over 3700 metric tons of Jatka are caught annually during their nursery season from inland rivers. Jatka is usually a plankton feeder preferring zooplankton, and the rate of food intake is comparatively very high at this stage, but with the age and seasonal variability it changes its food habitat, and becoming bigger changes to phytoplankton feeder. And during maturation Hilsa shad decreases its food intake and cease feeding for the duration of spawning migration. After growing for 1-2 years in sea, Hilsa shad matures and reaches an size of 32-55 cm prior to their spawning migration towards inland rivers, and the cycle continues. Migration of Hilsa shad is not limited to monsoon only, but it also migrates for a short period during winter. In other words it can be said that Hilsa shad is available in the river through out the year. But the peak catch periods are during upstream migration in monsoon and winter. During the peak catch period, due to shortage of sufficient storage facilities and ice availabilities, in addition to high temperature and poor transport facilities to northern part of the country, huge quantity of caught Hilsa shad is destroyed each year. Therefore steps should be taken to promote the export of fish, which could not be locally consumed during the peak catch periods.